It’s projected that around 50 million Americans suffer from allergies. Some of these are so severe that the people that have them can’t go outside during allergy season. Does this sound like you? 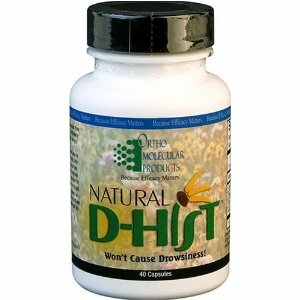 Natural D-Hist is comprised of a fast-acting formula that won’t cause drowsiness and has no other side-effects. With Natural D-Hist’s special formula you will be able to enjoy the outdoors any time of year. What ingredients are in Natural D-Hist capsules? Stinging nettles leaf is used for several reasons: it contains quercetin and other flavonoids that promote healthy cells‚ and also has pain-relieving and anti-inflammatory properties that may lessen the symptoms of common allergies. Bromelain is an enzyme found in pineapples. It contains anti-inflammatory properties and may help reduce sinus inflammation. N-acetyl-cysteine is used as a mucolytic agent that helps it dissolve the thick mucus that contributes to stuffy noses‚ promoting clear breathing and decongestion. Quercetin dehydrate is the form of quercetin that’s absorbed most efficiently by your body. Quercetin is a flavonoid found in red wine and other foods. As a flavonoid‚ it protects your body’s cells from free radicals and oxidation. Quercetin also acts as an anti-inflammatory‚ decreasing allergy symptoms by blocking your body’s production of histamine. Histamine is a natural chemical produced in response to certain stimuli. It produces allergic reactions such as sneezing‚ nasal congestion‚ and itchy skin. Many classic antihistamines tend to make you sleepy. Vitamin C is used for so many purposes in the body‚ and one of the most well known functions is its believed ability to reduce symptoms of the common cold. New studies also suggest that vitamin C can act as an antihistamine. For more severe or more constant allergies‚ this 120 capsule version of Natural D-Hist is a great option. This larger quantity will ensure you won’t run out of allergy relief in a time of need. It’s also great if you are using the ‘loading dose’‚ which consists of taking multiple capsules throughout the day. Buying this Ortho Molecular Products supplement from us in bulk will also save you money! (This product may contain one or more of the following: Calcium silicate‚ magnesium stearate‚ microcrystalline cellulose‚ silicon dioxide‚ and stearic acid).